"Winter is coming." For most people throughout the world, these words are generally associated with George R. R. Martin's famous saga A Game of Thrones. But for us here in Alaska, the words aren't merely a pop-cultural reference, but instead ring a very real truth: the days are getting noticeably shorter, the nights are increasingly longer and colder. Winter is here, but that doesn't mean the winter blues have to come with it. Approximately 6% of the U.S. population suffers from seasonal affective disorder (SAD). SAD is a type of depression characterized by its recurrence around the same time every year. While a small percentage of people afflicted with SAD show symptoms in the spring or early summer, the majority of people with SAD begin to show mild symptoms in the fall, which gradually become more severe as the season progresses, and then begins to subside around the onset of spring. The prevalence of SAD is also higher amongst the northernmost states where winter months are darker, colder, and last longer. A disruption of the circadian rhythm. Your circadian rhythm is your built-in, endogenous, body-clock that regulates the time periods of sleepiness and wakefulness. In most people, the circadian rhythm revolves around natural daylight and darkness periods, making them more awake and alert during the day, and more tired or asleep at night. The reduced levels of daylight during the winter months potetially throw off your circadian rhythm leading to feelings of depression. Reduced serotonin levels. Serotonin is a brain chemical secreted by the pineal gland that helps regulate mood. Daylight stimulates the pineal gland to produce more serotonin, and when darkness begins to settle in, the gland shifts to produce melatonin instead. Changes in melatonin levels. Melatonin is a hormone that helps control your circadian rhythms and sleeping and waking cycles. With the changing daylight patterns, the body's production of melatonin can become disturbed, throwing off your regular sleep patterns and leading to symptoms of seasonal affective disorder. Women are more likely to be diagnosed with seasonal affective disorder than men, although symptoms in men are often more severe. People with a family history of SAD are more likely to be diagnosed with the disorder than those with no family history. People who live further away from the equator are more likely to have seasonal affective disorder. As one gets further from the equator, patterns of daylight and darkness become more varied throughout the seasons. 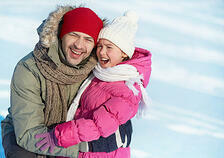 As a result, SAD is more frequently diagnosed in people who live in northern climates. People between the ages of 15 and 55 are more likely to have seasonal affective disorder. The study, which took place at the University of South Wales in the United Kingdom, found that people with brown or very dark eyes may be more likely to be affected by Seasonal Affective Disorder (SAD) than those with blue or other light-colored eyes.1These results are based on an investigation that included 175 college students, all of whom attended one of two universities, either in South Wales or in Cyprus. Another factor could be the production of melatonin, a hormone released in the brain that helps keep our circadian rhythms in sync. This is also related to the pigmentation of the irises, and since people with lighter eyes have less pigmentation, they produce less melatonin during the winter months than people with darker eyes. Melatonin typically helps us fall asleep, but producing greater quantities can result in feelings of lethargy or depression. In any case, while this research was not designed to prove cause and effect, it did demonstrate a connection between darker colored eyes and an increased chance of developing SAD. Light Therapy (phototherapy). Because the disorder is most likely caused by a lack of natural sunlight, the number one prescribed treatment for SAD is light therapy. For this treatment a specialized light therapy box is used that simulates daylight. 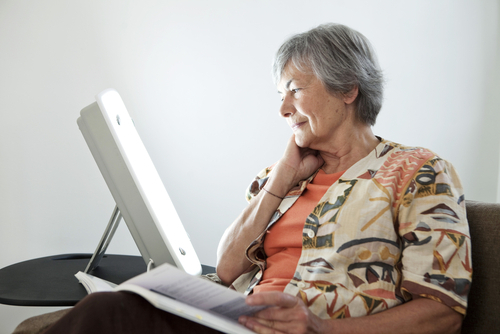 The light-box is placed a close distance from the user, either on a desk or a table, while the user eats breakfast, reads, or even works at a computer with their body and face positioned towards the light. Looking directly into the lights is not recommended, but one should focus on activities that are illuminated by the lights. Depending on the recommendations by a medical professional, durations of light therapy treatments may vary anywhere between 15 minutes to 3 hours once or twice daily depending on the user's needs and equipment type. Light therapy generally begins to show positive results in as little as 2 to 4 days with few to no side effects. Antidepressant medications. Similar to other depression types, your physician may prescribe antidepressants as a treatment. Because SAD is linked to low levels of serotonin, a serotonin selective reuptake inhibitor (SSRI) may be prescribed. Common antidepressants used in treating seasonal affective disorder are: fluoxetine (Prozac), sertraline (Zoloft), paroxetine (Paxil), citalopram (Celexa), and venlafaxine (Effexor). If you have been previously diagnosed with SAD, your doctor may recommend starting antidepressant treatment a few weeks before your symptoms typically begin, and continue a short time beyond when they normally reside. Get outside. Because SAD is directly linked to a lack of daylight, it's important that you try and make your environment as sunny as possible. When there is daylight outside, get as much of it as possible. Schedule your work breaks for a time when there is ample daylight available and get outside and go for a walk. On weekends (weather permitting) get involved in outdoor activities such as skiing, snowshoeing, snowmachining, or even build a snowfort with your children. Make your environment brighter. If getting outside during daylight is out of the question because of scheduling or severely cold temperatures, you can still soak up some of that natural light. Open your blinds and curtains and sit near a window during daylight hours. You can even trim back trees that block sunlight or have a skylight installed in your home. Exercise regularly. Physical exercise has been proven to relieve stress and anxiety, both of which can lead to symptoms of seasonal affective disorder. If the weather is too severe for outdoor physical activities, join a gym or get equipment in your home. As you get in better shape you will naturally begin to feel better about yourself, which can lift your mood. At The Alaska Sleep Clinic we understand that the dark, winter nights can be difficult for many, and even cause severe symptoms of depression in others. Because depression is often linked to sleep disorders, we want to help you get the best treatment for your disorders possible. If you think you, or a loved one, may have seasonal affective disorder, feel free to contact us for any of your sleep related needs, and get started on your way to a happier, healthier life.